Additional reports and research addressing the use of corporate capital to repurchase stock can be found in the "Stock Buyback Policy" reference section of a Forum project that had addressed a company-specific example, and in the user-input models developed in a recent Forum workshop for Buyback Analysis. Corporate insiders are personally capitalizing on the recent boom in buyback announcements, vexing a top regulatory official. Taking advantage of price bumps that often accompany share-repurchase announcements, company executives have been selling significantly more of their stock immediately after the news than they do beforehand, according to an analysis by Robert J. Jackson, Jr., a commissioner at the Securities and Exchange Commission. In a speech on Monday, Mr. Jackson—appointed by President Donald Trump and sworn in this year to fill a Democratic seat at the SEC—will urge regulators to review securities laws that provide protection to insiders making such trades. Insiders who sell stock into buyout bounces aren’t trading illegally, of course, and Mr. Jackson isn’t accusing them of that. And other investors also have the opportunity to take advantage of the bumps. But these price surges can be especially beneficial to corporate executives holding large chunks of corporate stock looking for an uptick to unload shares. Mr. Jackson, a former law professor, examined stock trades at 385 companies that announced buybacks in 2017 through this year’s first quarter. He found the percentage of insiders selling shares more than doubled immediately following their companies’ buyback announcements as many of the stocks popped. Daily stock sales by the insiders rose from an average of $100,000 before the buyback announcements to $500,000 after them. The sellers received proceeds totaling $75 million more than had they sold before the announcement, the study concluded. At 32% of the companies, at least one insider sold in the first 10 days after the buyback announcement. As is customary among SEC commissioners, Mr. Jackson is careful to note that his views are his own and don’t reflect those of the entire agency. The SEC didn’t return an email seeking comment. What’s clear is that such corporate share-repurchase programs have grown increasingly popular among companies. 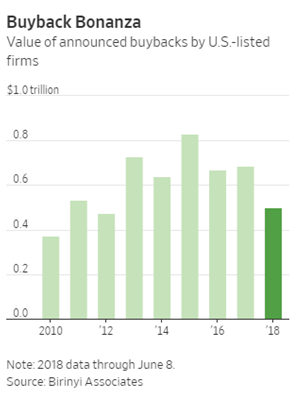 So far this year, buyback announcements from all U.S. publicly traded companies totaled just over $500 billion, according to data from Birinyi Associates Inc. For all of last year, companies announced $685 billion in buybacks up from $670 billion in 2016. The recent activity follows changes to the tax law that made buybacks more attractive for companies. Many investors welcome the deals because they often boost a stock’s price, but some consider them a dubious use of corporate capital if they are made at high valuations or if the returns from buybacks don’t exceed an investment in the business. Stock repurchases can make a company’s earnings per share appear better by reducing its number of shares outstanding. Buybacks can also bolster executive pay at companies using benchmarks based on earnings-per-share increases. Mr. Jackson’s study didn’t identify specific companies. 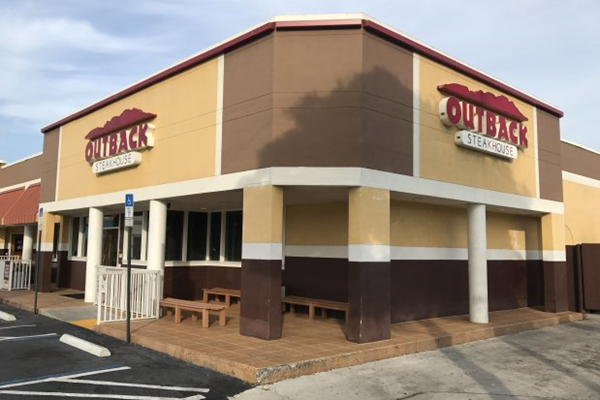 But Bloomin’ Brands Inc., the operator of casual-dining spots including Outback Steakhouse, illustrates the trend. Before the market opened Feb. 22, the company announced its earnings and noted the existence of a new $150 million stock-repurchase program. At issue is Rule 10b-18 of the Securities Exchange Act of 1934, which advises companies how to proceed with buyback timing and other mechanics, such as prices paid and volume restrictions. It also provides a “safe harbor” for officers or directors to trade in the shares during a repurchase without running afoul of antifraud provisions of the securities laws. Mr. Jackson believes that executives who sell into buybacks are benefiting at the expense of shareholders. “If an executive believes a buyback is the right thing for the long term, they should put their money where their mouth is and keep their stockholdings,” he said. The study also found that in the days leading up to share repurchase announcements, the companies’ stocks underperformed the broader market by an average of 1.4%. During the 30 days after the announcement, the companies’ stocks outperformed the overall market by an average of 2.5%. Mr. Jackson is scheduled to present his analysis Monday at the Center for American Progress, a left-leaning think tank in Washington. The study parallels his past academic work on corporate governance issues. He taught law at NYU and Columbia and was founding director of the Columbia Law School’s Data Lab, which used technology to study the reliability of company disclosures.